Home > Community > Sneak Peek > You’re About To Get Lucky…The March Sneak Peek Is Here! You’re About To Get Lucky…The March Sneak Peek Is Here! It’s everyone’s favorite time again – time for your first peek into all the goodies that await in next month’s snack box! 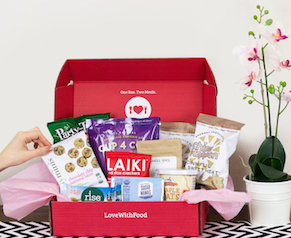 Lucky for you, our March box is our most delicious yet. Snacking guru and video aficionado Katie is here to give you the scoop on our Happy Go Lucky box – and trust us, by the end of the video all of you super snackers will be feeling pretty lucky. Watch our March Sneak Peek below and get ready to get hungry! 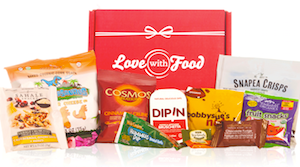 What's in the Love With Food Feb '17 Box? SPOILERS! Congrats to Our February Sneak Peek Noshable winner! Thanks so much to Alina L.! Your amazing and inspiring answer to our February question made us all proud to call you a Love With Foodie. Yoy’ve got a very special box of goodies coming your way soon! Want to be our March Sneak Peek winner? Easy! Just comment below about how you’re going to make this month a little more lucky for yourself! The best answer wins a special box of goodies!